6. Be creative - try on a belt, in your hair, the possibilities are almost endless. Our rings are frankly fake, just for fun, and are adjustable. Description: Huge Rose Brooch in Jonquil (Pale Yellow), Colorado Topaz and Multi Green Rhinestone - Three dimensional brooch is 5 1/4" x 4 1/4" x 3/4" deep, with a double clasp to help hold this in place. 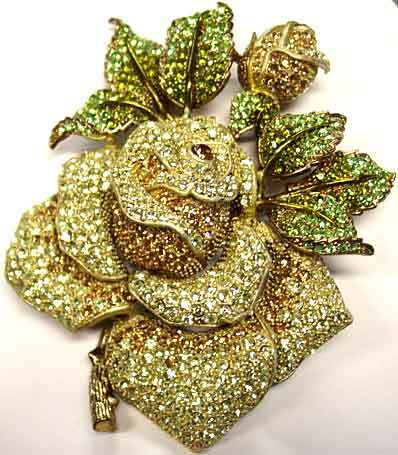 Setting is a dark goldtone with lime and olive green rhinestones on the leaves. Whether you love florals, or just need a statement piece, this will command attention. 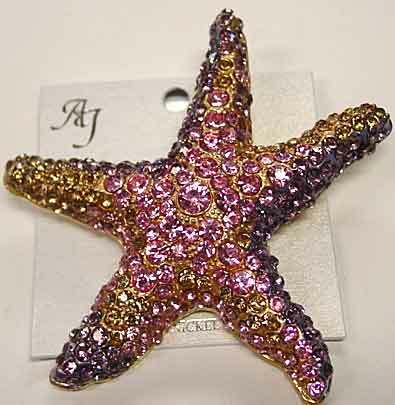 Description: Pink/Lavender/Citrine Rhinestone Starfish Brooch - At 3 3/8" at the widest point, this brooch will satisfy those who love their bling. Pink rhinestones are in the center of this piece, with most of the sides and points done in lavender rhinestones, and the rest in bright yellow rhinestones, with a yellow wash behind the yellow stones and purple-silver wash behind the purple stones. Domed, set in goldtone, much prettier in person. 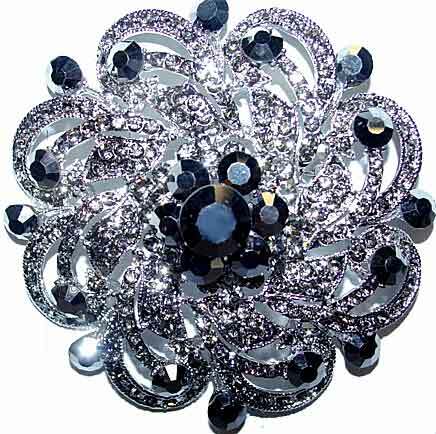 Description: Huge Black Diamond/CAD Rhinestone Pinwheel Brooch - Domed, 3" in diameter, this substantial piece showcases Comet Argent Dark (dark metallic grey) and black diamond rhinestones.Silvertone setting, domed, about 3/4" deep. A real attention getter for a modest price. 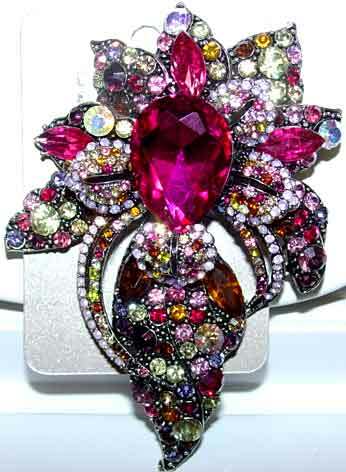 Description: Fuchsia/Multi Colored rhinestone Brooch/Pendant - Centered with a large "fat" pear shaped stone in fuchsia, this piece has a rainbow of accent colors - yellow, topaz, pink, purple, lavender, faux opal, faux tanzanite, and clear aurora borealis. 4" x 2 5/8" and very 3-D with curving stacked leaves. Silvertone setting; this could also be used on a heavy chain as a pendant or perhaps worn on a velvet ribbon at the throat. Fabulous on most solid colors, you will love this exuberant piece. 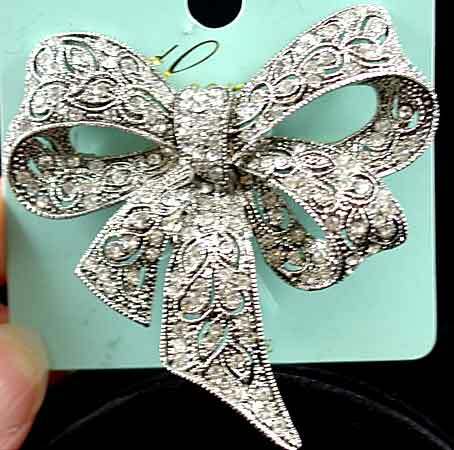 Description: Clear Rhinestone Vintage Style Bow Brooch - Although this looks like it might have been done 80 years ago, this is brand new. 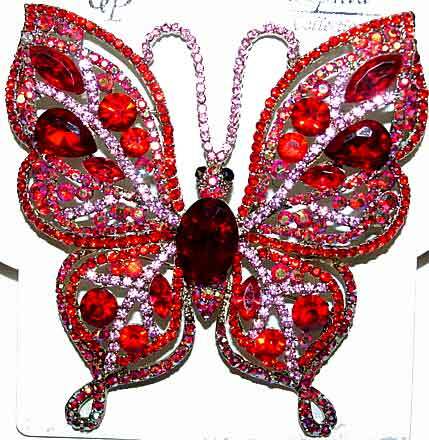 2 5/8" x 2" at widest points, and about 1/4" deep, with dimensional loops, all clear rhinestone set in a cut-out design. Slightly antiqued silvertone setting also lends to the vintage feel. 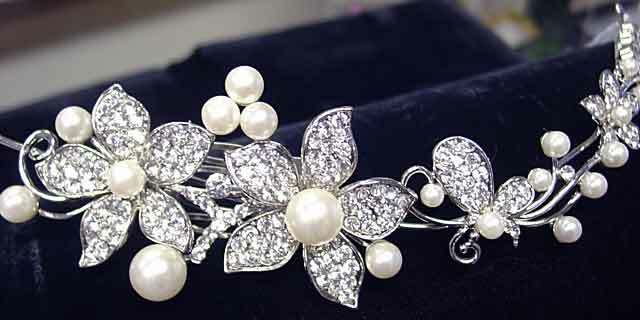 So romantic, and excellent for any way you would like to wear a brooch, or also in a brooch bouquet. 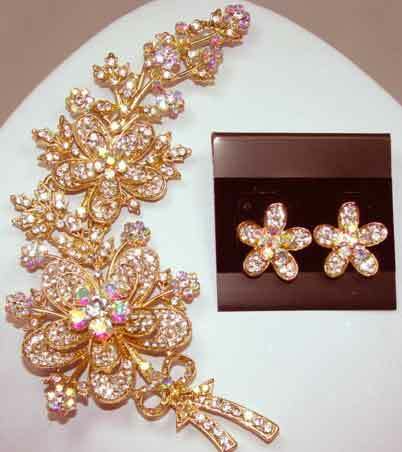 Description: Large Floral Brooch & Earring Set - Long and slender, this curving brooch is actually somewhat delicate looking for its 5 1/4" x 2" size. Matching pierced earrings are relatively small at 7/8" in diameter, making an excellent balance. These pieces use clear aurora borealis rhinestones for the centers of the flowers, with clear pave set petals underneath. 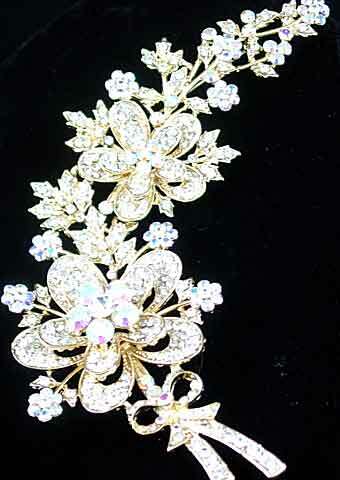 Goldtone setting, the brooch has two pinbacks to secure upper and lower sections nicely. Wonderful on a lapel but use your imagination for other great places to use this. 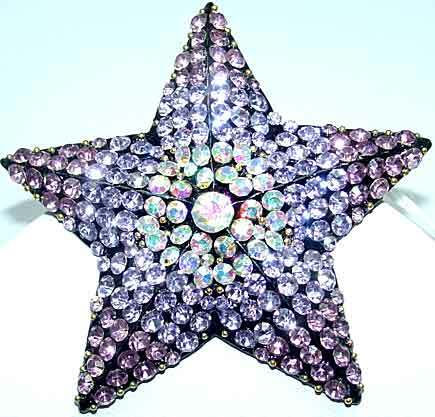 Description: Multi Purple Star Brooch - Two different shades of light purple rhinestones and a center of aurora borealis stones "pop" against a background of black enamel. 2 1/4" in diameter, each point of the star is beveled to give dimensionality. Great price. 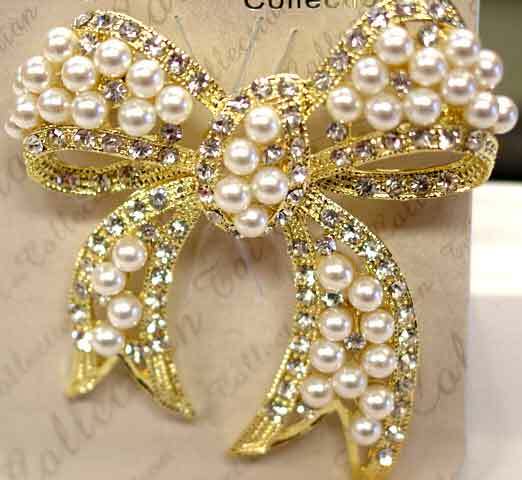 Description: Goldtone Glass Pearl & Rhinestone Bow Brooch - Classic bow design uses 43 3.5mm white glass pearls in a goldtone setting with edges of ribbons set with small clear rhinestones. Approximately 2" x 2". 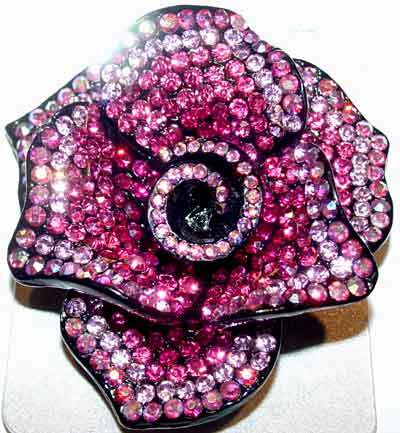 Description: Fuchsia/Pink/ PinkAB Rhinestone Rose Pin Pendant - This is a little larger piece at 2 3/8" in diameter and approx 3/4" deep. The darkest color, fuchsia, is towards the center, with rose pink and blush pink used the closer to the ends of the petals that you come. Borders of all petals are done in pink aurora borealis. Black enameled top, dark hematone finish. This can be worn as either a pin or a pendant. Weighty, you will probably want to use this on a heavier fabric. Description: Zebra Stripe Ring - Clear and black stones alternate in rows on this domed ring. 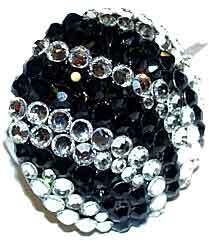 1 1/4" in diameter; clear stones are flatback glass stones, black stones are standard rhinestones. Stones are paste set to black thermoplastic. Silvertone shank is open in back to conform to most finger sizes. Whether you like animal print designs or simply like black/clear combinations, this is a fun ring for parties and special occasions. 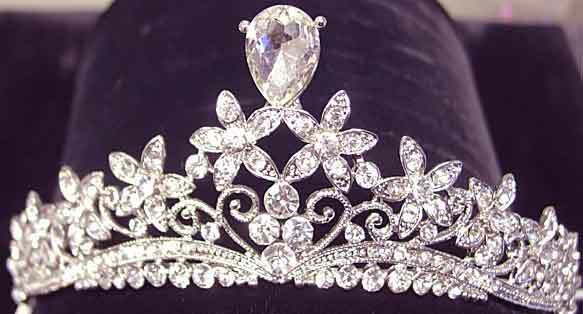 Description: Ornate Clear Rhinestone Tiara - A graduating design of curves and a probably stylized floral design around clear rhinestone pearshaped stones, this measures 7/8" at the sides and 1 1/2" at the center. 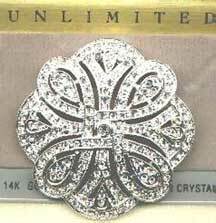 Silvertone setting, 11 1/2" to ends, 7" of which is all rhinestone set. This has end holes for inserting bobby pins for attaching this to head, though it does not have any bobby pins attached. 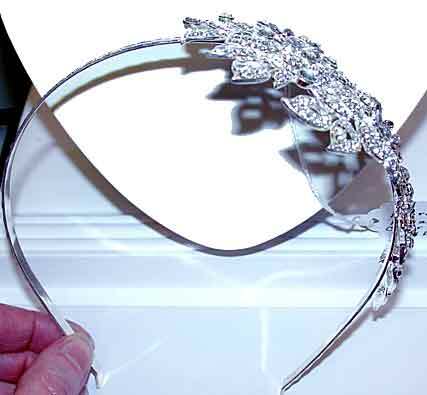 If you are a fan of Downton Abbey on PBS, you may notice that this has a similarity to some of the headpieces worn by the actresses in the series. From Marielle. Description: Floral Glass Pearl and Rhinestone Headpiece - While there are probably different ways this could be worn, I think it would work well for a French twist or similar type of hairstyle. This has larger flowers on one end, and smaller on the other, but I don't think that you necessarily have to wear it with the larger flowers higher. This has holes on the end for bobby pins for attachment (though bobby pins are not included). This curving piece measures about 10 1/2" long, and is 1 3/4" at the widest point, tapering off to less than 1/4" at the smallest stone. 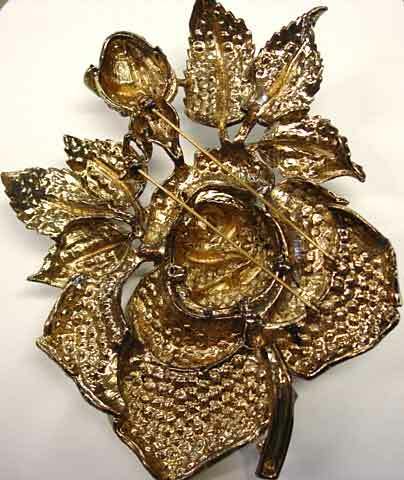 There is also a 3/4" wide comb behind the flower at the end on the left in the picture for additional stability. Silvertone setting, glass pearls are white, all rhinestones are clear. 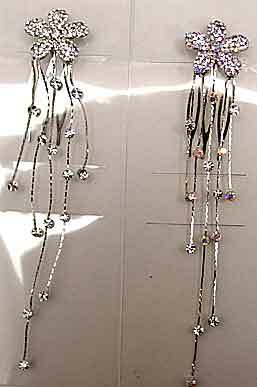 Description: Sassy South Floral Dangle Hair Combs - Pave set florals top 5 asymmetrical stone set dangles. Floral measures about 1" in diameter - longest dangle to top of floral is about 5". Silvertone. 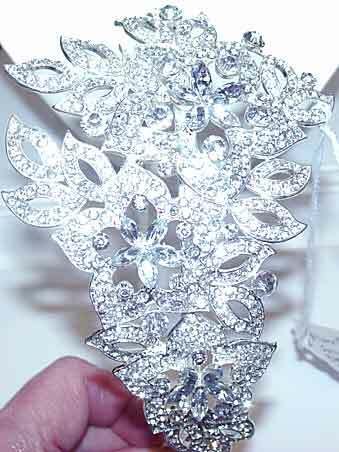 Description: Ornate Clear Rhinestone Headband - Floral and leaf motif headband all done in clear rhinestones. Three fleuettes are done in clear marquises, the rest of the stones are all rounds. Silvertone, the decorative part measures 6" x 3 3/8" at the widest points.